Winemaking has been a Coppola family tradition for several generations. Agostino Coppola, Francis Coppola’s grandfather, used to make wine in the basement of his New York apartment building using concrete vats he constructed himself. The wines that Francis Coppola makes today aren’t the same as those Agostino made, but they are produced in the same spirit—for sharing with friends and family. 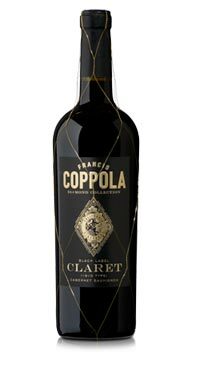 Coppola’s signature red wine, layered with flavours of blackberry, cassis and roasted espresso. Claret is a Cabernet Sauvignon-based wine, blended in the classic Bordeaux style. The label honours the first Cabernet Sauvignon blended in a Bordeaux style by Gustave Niebaum in 1910. Claret is a term originally coined by the British to describe Cabernet-based wines. This Cabernet Sauvignon, Petit Verdot, Malbec and Cabernet Franc blend is alluring and sophisticated; it is memorably lush with a tapestry of smooth tannins and succulent flavours of wild berries, plum and anise. Borrowing tradition of European wineries, we add gold netting to bottle to signify outstanding quality of wine.